The Internet of Things (IoT) era is here. Smart sensors, mobile devices and interconnected systems are generating, collecting and transmitting enormous volumes of data -- changing almost every aspect of business. The IoT represents a transformational opportunity to act on the data produced, gaining real-time insight into product performance and usage. These insights can refine or invent new product or service capabilities, address new markets and even redefine your business models. 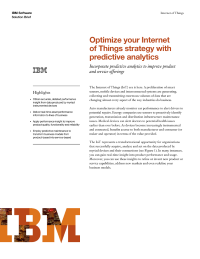 Download this solution brief to learn how your organization can obtain accurate and detailed performance insight from this type of data, deliver real-time asset performance information, apply performance insight to improve product quality, and employ predictive maintenance to transform business models.